The Handbook presents a step-by-step approach to developing MSP indicators. In particular, the Handbook aims to provide the maritime spatial planning community with suggestions on the use of spatial indicators that could support the consideration of Blue Growth in MSP processes. 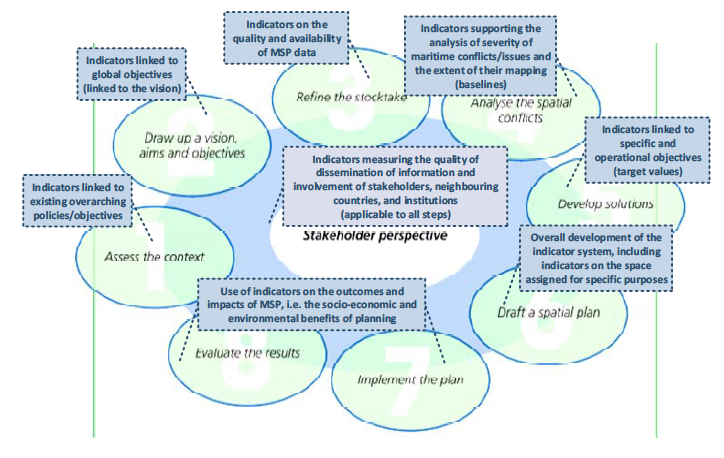 There are no one-size-fits-all solutions for MSP and related indicator development, which is why the Handbook offers a flexible approach with examples of possible indicators that need to be customised to the local contexts. A short and operational version that provides a ready-to-use checklist and guiding questions for practitioners with hands-on-experience in MSP. A long version aimed at MSP stakeholders with interest in the overall theoretical framework of indicators. It provides a detailed description of the role of indicators in the MSP cycle, an overview of the indicator development process, as well as a detailed process description for developing these indicators. How to develop spatial indicators that could support the consideration of Blue Growth in MSP processes? What are the limitations and possible uses of MSP indicators? The Handbook was developed under the Technical Study ‘Maritime Spatial Planning (MSP) for Blue Growth’ in 2017. It was discussed and fine tuned in a dialogue with MSP responsible authorities i.e. members of the Member States Expert Group on MSP. To assist MSP authorities in their planning processes by providing suggestions, checklists, and examples of possible MSP indicators linked to Blue Growth. The Handbook presents a 3-step approach, which first involves defining SMART (Specific, Measurable, Attainable, Realistic and Time-bound) objectives. The next stage involves the identification of indicators to suit different levels of objectives as well as dimensions in which MSP takes place. Defining indicators goes through a series of steps from identifying information sources, defining baselines, defining targets and external factors, and finally developing a complete indicator system. The third step focuses on the monitoring and reporting on these indicators. The Handbook was developed through a desk research review of previous studies and MSP practices in collaboration with MSP authorities and other practitioners. The document outputs include an overarching Blue Growth Indicator as well as five other types of indicators and guidance on how to select them. These include impact indicators, outcome indicators, output indicators, MSP process indicators and additional ecological indicators. The overarching blue growth indicator combines various inputs from all the Blue Economy sectors, depending on the MSP Objectives. Additionally, it incorporates what MSP authorities, based upon existing facts and future scenarios, may choose to align to a specific Blue Economy sector. For instance, an objective to maintain a productive economy in the coastal regions is indicated by the Gross value added in coastal areas and measured in millions. Impact indicators take stock of the developments of the Blue Economy sectors and are linked to global objectives. They take into consideration trends of economic development in the Blue Economy sector. They are mostly useful as context variables rather than as indicators showing the success of MSP. For instance, an objective for increased wind power generation at seas is indicated by the amount of MWh of wind power generated at sea. The guide can be applied for developing indicators for all key maritime economy sectors and can be adapted for use in all sea-basins.